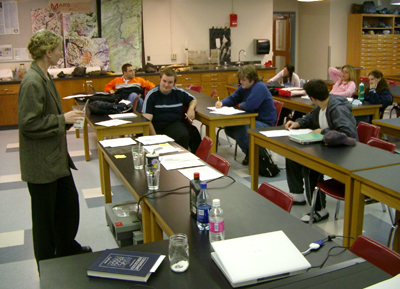 What is an Interactive Lecture Demonstration? Research shows that students acquire significantly greater understanding of course material when traditional lectures are combined with interactive demonstrations. Each step in Interactive Demonstrations--Predict, Experience, Reflect--contributes to student learning. Prediction links new learning to prior understanding. The experience engages the student with compelling evidence. Reflection helps students identify and consolidate that they have learned. Identify a core concept that students will learn. Chose a demonstration that will illustrate the core concept, ideally with an outcome different from student expectations. Prepare written materials so that students can easily follow the prediction, experience and reflection steps. Ready to use examples are available and can be browsed by topic. A compilation of references and resources about Interactive Lecture Demonstrations.